I saw an interesting UDRP filing I want to share with you. A UDRP was filed at the World Intellectual Property Organization involving Fenwicks.com. The case is WIPO Case D2017-0579. Fenwicks.com was registered in October of 1996, making this domain name more than 20 years old. The domain name appears to be privately registered until just recently, with privacy being removed likely because of the UDRP filing. Now that the Whois record is no longer private, I see that the domain name is registered to a registrant called Fenwick Associates. It appears that the last name of the person associated with this entity is Fenwick. I used DomainTools Whois History Tool to see how long this entity was the registrant of the domain name. The first archived Whois record for this domain name is 2001. The registrant? Fenwick Associates. It looks like the same registrant has owned it since at least 2001 and almost certainly even longer. In fact, an Archive.org record from 1998 shows Fenwick Associates listed on the bottom of the archived website. I visited Fenwicks.com today, and I only see a default GoDaddy coming soon parked page. 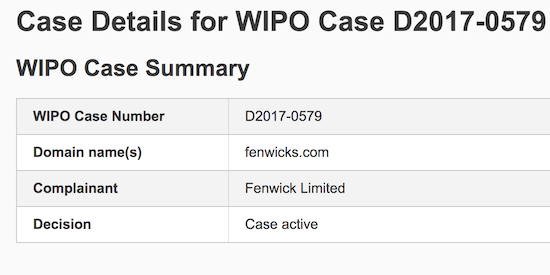 The complainant in this UDRP is a company called Fenwick Limited. I believe this is a department store called Fenwick (unless it is a different Fenwick Limited), and the company operates on the Fenwick.co.uk ccTLD. Interestingly, a large law firm called Fenwick & West operates on Fenwick.com. Based only on what I am able to see, it appears a company is trying to get a domain name rightfully owned by someone for at least 19 years and quite possibly even longer. I am not privy to any non-public information, but I don’t see how they will be able to show that the domain name was registered and used in bad faith, especially given the fact that the domain name was being used by the registrant in 1998 and possibly earlier. If I am not missing something important, I feel badly for the domain name owner who will likely incur legal expenses to defend a domain name that has been owned for about two decades. Update: According to UDRPSearch.com, this UDRP was terminated. I reached out to Mr. Fenwick to see if he can comment. The domain name appears to still be registered to Mr. Fenwick. Crazy UDRP case. The question is why are they going after Fenwick[S].com and not Fenwick.com. And why haven’t they gone after fenwickS.co.uk which is up for sale. I think the respondent should prevail in this one unless he gets one of the many lunatic arbitrators. He should also be able to ask for and receive a finding of reverse domain hijacking. I think they can see who owns Fenwick.com and know it would end up costing them money if they were sued in US federal court for reverse domain name hijacking. I’ve retained the legal services of Fenwick.com in the past. One of the most powerful law firms in the world. Expect billing at $900 per hour. They represent Google, Facebook, Sony, Samsung and many tech companies with valuations over $1 Billion. Fenwick’s IP division consistently ranks in the top 10 in the world, sometimes #1. Per the fenwick.co.uk website, Fenwick Limited traces its common law trademark back to the 1800s. It likely has a registered trademark from the early to mid-1900s that pre-dates the 1998 registration of Fenwicks.com. Ergo, they may believe they have a legitimate case under UDRP. Why they believe they deserve the plural or possessive version of Fenwick is anybody’s guess. And why did they wait so long to lay claim to the name when it seems it has been owned by the same entity for so long? I agree completely with Elliot Silver and KoolBranding… Why isn’t this Fenwick Limited company going after Fenwick.com??? Why aren’t they going after the domain FenwickLimited.com? I agree they should go after the fenwicks.co.uk. If the person who has had fenwicks.com has had it from 1996 and is a legit business, why is the large conglomerate business trying to STEAL it from them? That is just PLAIN UNFAIR!!!! Where does common decency come into effect????? Really, this is totally not right!!! Coincidentally my aunt, Deirdre Fenwick, passed away yesterday in Grimsby, UK aged 80. I’ve been through two UDRP battles, writing the responses myself to single judge panels. Each complaint coincided with a family event. The first with my daughter’s wedding. Despite a lot of writing effort we lost that UDRP decision to one of America’s largest corporations. We still consider the domain generic. The second UDRP arrived on the the day of my granddaughter’s birth. We won the UDRP decision against a well-known U.S. corporation. But a year later they came back with a lawsuit. Instead of just a phone call to buy the name for $1000, they racked up $24,000 in legal fees with 13 attorneys and paralegals in two states. Fortunately, the District Court judge declared my arguments had merit, ordering the corporation to compromise. I wasn’t even that attached to the obviously generic domain so, to save time and angst, I gave it to them in exchange for dismissing the legal fees..
Perhaps, as a Domainer with 900 domains, such cases are inevitable. However, they’re exhausting and a great waste of time, toner and paper! Sorry to hear about the passing of your aunt.